It seems the Paris firefighters did a fantastic job saving at least the structure of that iconic symbol of christianity and demonstration of what man can create. But the losses to art and history will still be insurmountable. There will be a rebuilding effort to the building that took more than two hundred years to built, stood more than 800 years and survived the French Revolution and two World Wars. But it might might take very well decades to fully restore this magnificent cathedral to its full glory. And I hope to live to one day walk down once more the central aisle and feel the awe I always felt when visiting this place of god, art, history and light. As I’m on a business trip and traveling light, I didn’t bring the USB drive with my full photo library. The only photo of Notre Dame I was able to pull was the one I uploaded ten years ago to my Flickr account (that I really don’t use anymore but that is still there). I was passing through Paris on yet another business trip, and while walking from the hotel to the law firm for a negotiation meeting, we passed Notre Dame on that cold January morning and I snapped that image with the Panasonic TZ-5 I was using back then as compact travel camera. The magnificent roof, the spire, and most likely also the beautiful stained glass windows are no more. When back home on the Easter weekend I will look through all my old images from my visits to Notre Dame and post a proper tribute to this Cathedral of Light, that hopefully will rise again from the ashes. It was so sad to see. I am down at the beach and was stunned when I heard the news. I feel so lucky to have had a chance to see it, but really was hoping to see it again since our visit was brief because my daughter didn’t feel well. Very, very sad. The fire and the building’s survival could be a metaphor for these times in which we live. Though with much destruction, the grand building has survived, and so will we. Although it will never be the same, I do hope the cathedral can be rebuilt to its former magnificence, and in our lifetimes. I never got to see Notre Dame, but have a friend who just visited two weeks ago. It’s amazing how deeply one can feel connected to a building that one has never seen. Happy Easter to you too, Marcus! All we’ll have of the grand old lady for quite a while is our photos and our memories. Like many was devastated to see Notre Dame ablaze and brought back many memories of visiting and appreciating the history and ifs historical significance. Yet this will be just an another chapter to Notre Dame’s history and that of France for many that will proceed us. Thanks for the images. I agree with you that the firefighters did a fantastic job, Marcus. When I saw the size of that horrific fireball, and the spire’s collapse, I thought the entire cathedral would soon follow. But somehow they saved the shell — those stones that have witnessed so many centuries of human emotion and hope. She will rise again, and will be more cherished than ever, because now we know how it feels to have almost lost her. 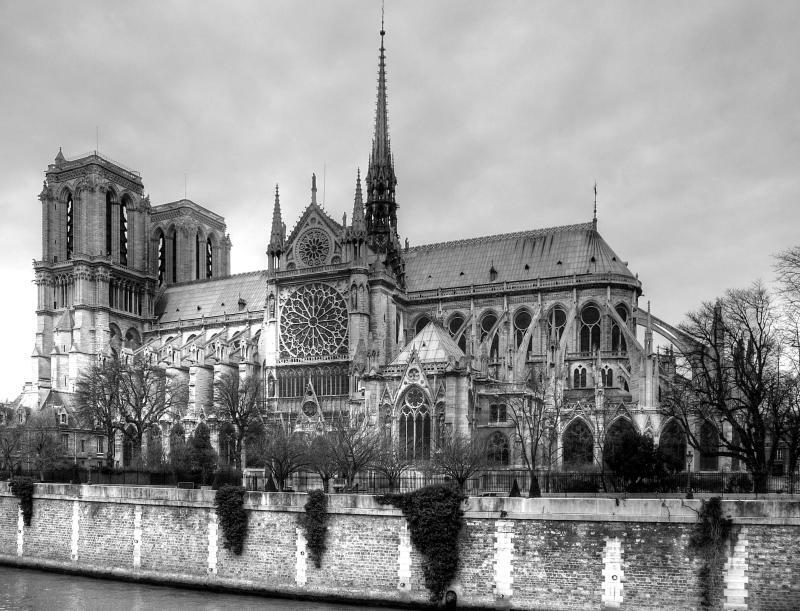 Many of us share your heartbreak as we think of visits to Notre Dame and review the photos taken there. I will probably not live long enough to see Notre Dame re-built. I feel so fortunate to have visited this grand lady in 2017! This was devastating news and no rebuilding will ever replace all of the lost art damaged to fire and water! Such a tragedy. Its really heartbreaking. Thank you for sharing this. We just happened to turn the TV on to the CBS special report as the flames took down the spire. Shocking to say the least. When I saw the scaffolding I thought of what might be the cause: a tragic lapse in judgement by one of the contractors. Time will tell…. I look forward to your sharing your tribute. So so sad. Lived there for 7 years and my heart was broken – MZ. I couldn’t believe the news either! I was there in 2013 and it is such a beautiful building. I look forward to seeing what pictures you find to post. Heaet beoke at the news of this mishappening. Thank you for this. What a stunning photo! It’s truly heartbreaking. Thank you for sharing. It’s a gorgeous photo. Yes, it’s heartbreaking. Such a magnificent structure! Beautiful post! Thanks so much for sharing. I’ve never visited Notre Dame or Paris for that matter but one doesn’t have to visit to make sense of its symbolism. I guess many of us will revisit movies and books and, yes, images reminding of the place as it once was. Look forward to seeing more of your images! Oh, and enjoy Chicago!